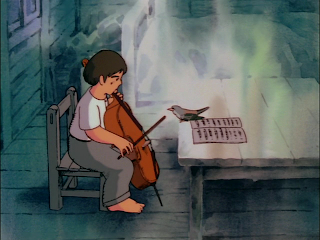 I finally managed to see the Ghibli ga Ippai DVD reissue of Isao Takahata's masterful movie from 1982, Gauche the Cellist. 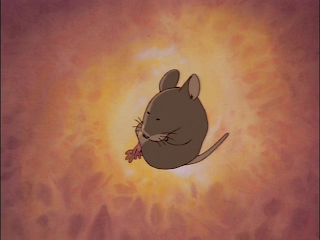 This is one of my absolute favorite movies, and, because of its short length (barely one hour), remains one of my essential go-to animation films. This is a movie you want to show off and share. The picture quality is greatly improved over the older Pioneer DVD; sharper, cleaner, more detailed. You can see for yourself how wonderful Gauche looks. 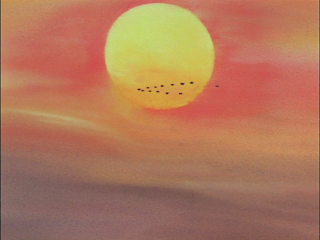 This is a painterly movie, full of vivid colors and impressionist brushstrokes. 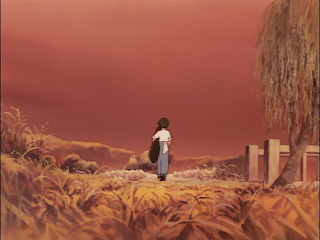 I always admired the use of lighting in the background, the way it made the contents of Gauche's house melt together. Sunsets are especially vivid, full of rich orange and reds and browns. 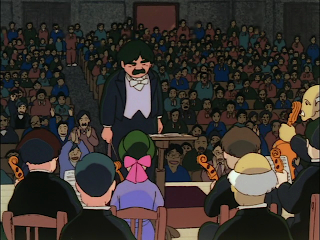 Takahata was at the peak of his powers when he created Gauche. It was a long labor of love and it shows. The naturalism, the humble neo-realism, the moments of human comedy and tragedy. 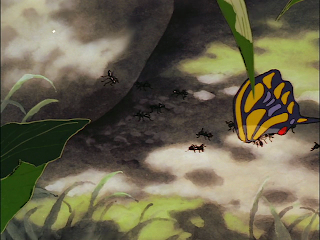 I've always admired the documentary shots in the opening scene, closeups of butterflies and ants. Would a Western movie contain these everyday moments, or would the temptation to hurl everybody along the roller coaster prove too strong? This is a meditative film, a reflective film. It is a rural film at its core, and a deeply musical film. A music lover made this movie. 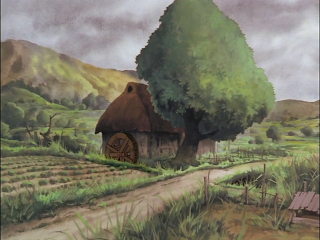 Because Gauche is now under the Ghibli name, this makes it possible for Disney to bring it to North America. They absolutely should do this, and do it immediately. I wonder if John Lasseter or any of the top people at Disney/Pixar even know this movie exists. 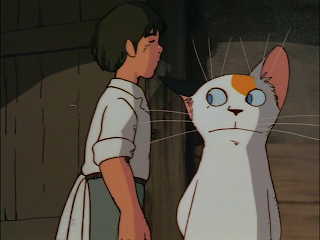 If ever a foreign animated movie was perfect for a domestic release, it would be this one. Please, Disney. Bring this movie to the States. I totally agree! I loved that movie! Especially since I"m a musician myself.